The Kershaw Scallion is about 20% larger than the Chive and perfect for just about anything! 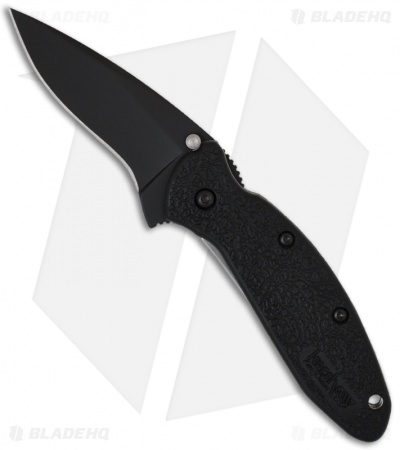 The light and durable black textured polyimide handles are fastened to a steel liner lock frame. The matte finished black TiNi 420HC blade has a plain edge. 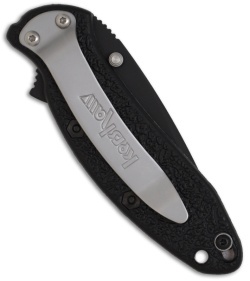 This SpeedSafe assisted knife features a dual thumb studs and a flipper for easy one-handed operation. Comes with a tip safety lock to prevent misfires. The stainless steel pocket clip is tip-down for convenient carry. Ken Onion design. I wear a large size glove and typically steer clear of knives this small but the Scallion is an exception thanks to Ken Onion's ergonomic design. The thumb ramp and flipper choil are placed perfectly for a superb grip. The jimping is perfect, not too sharp but still very grippy. It just locks into place when gripped. The GFN isn't particularly nice looking but it provides texture that the aluminum scales do not. The blade shape is unique, I would have probably preferred a combo edge just so I did not have to deal with sharpening the recurve. Still, it has cut everything I asked it to and the recurve is easily touched up with a sharpening rod. I really like the lock safety feature. You slide a tab which places a bar over the spine of the blade to keep it from opening when you don't want it to. This addition makes it a great knife to just throw in the pocket and removes addresses my only real concern with assisted opening. All in all, I think this is probably my favorite assisted Kershaw.